I am a number theorist at the University of Michigan. I got my PhD in 2003 from Princeton University working under the supervision of Andrew Wiles who now has a gorgeous math building named after him. My interests lie in the arithmetic of L-functions and algebraic cycles and especially in the conjectures of Bloch-Beilinson and Bloch-Kato which are vast generalizations of the Birch and Swinnerton-Dyer conjecture. A related research interest that I am very fond of is the study of periods of motives/automorphic forms. I am fortunate to have some fantastic collaborators, past and present: Massimo Bertolini, Henri Darmon, Atsushi Ichino, Chris Skinner and Akshay Venkatesh. The number theory group at UM includes Wei Ho, Jeff Lagarias, Hugh Montgomery, Andrew Snowden, Mike Zieve and myself. 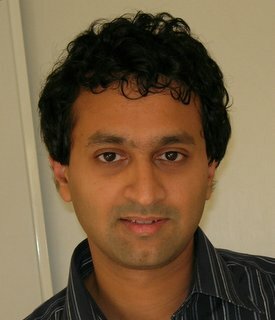 The department also has many faculty in related areas such as algebraic geometry (Bhargav Bhatt, Bill Fulton, Mircea Mustata, Karen Smith), commutative algebra (Mel Hochster) and Lie groups/algebraic groups/representation theory (Stephen DeBacker, Lizhen Ji, Tasho Kaletha, Gopal Prasad). Michigan is an exciting and friendly place to study number theory. If you are a prospective graduate student, you are welcome to write to one of us for more information on our program. We also have arguably the largest postdoctoral program in the country with currently around 60 postdocs across all areas of mathematics. The department has numerous seminars of interest to number theorists including Group, Lie, Number theory (GLNT), Algebraic geometry, Student arithmetic etc. During the academic year 2014-15, I was on sabbatical leave as a von Neumann fellow at the Institute for Advanced Study (IAS) and a visiting fellow at Princeton University, supported partially by a Simons Fellowship. I am an associate editor for Advances in Mathematics, and encourage submissions in number theory. Please submit articles directly on the journal website. Here are some additional links that may be of interest. 1. (Ernest) Hunter Brooks (2013), EPFL, Lausanne, (2013-17). 2. Ari Shnidman (2015), Boston College, (2015-18). 3. Adam Kaye (2016), Goldman Sachs. 4. Suchandan Pal (2016), Mavenir. 5. Charlotte Chan(2018), Princeton (2018-19), MIT (2019-2022). 1. Christopher Lyons (2010-2013), PhD Caltech (2010), Assistant Professor, Cal State Fullerton. 2. Ruochuan Liu (2011-2013), PhD MIT (2008), Associate Professor, Beijing International Center for Mathematical Research. 3. Cameron Franc (2014-16), PhD Mcgill (2011). Here is a link to a workshop I organized in Ann Arbor in May 2011. Some of you may fondly remember this as the "ice cream conference". However, the talks were also excellent.